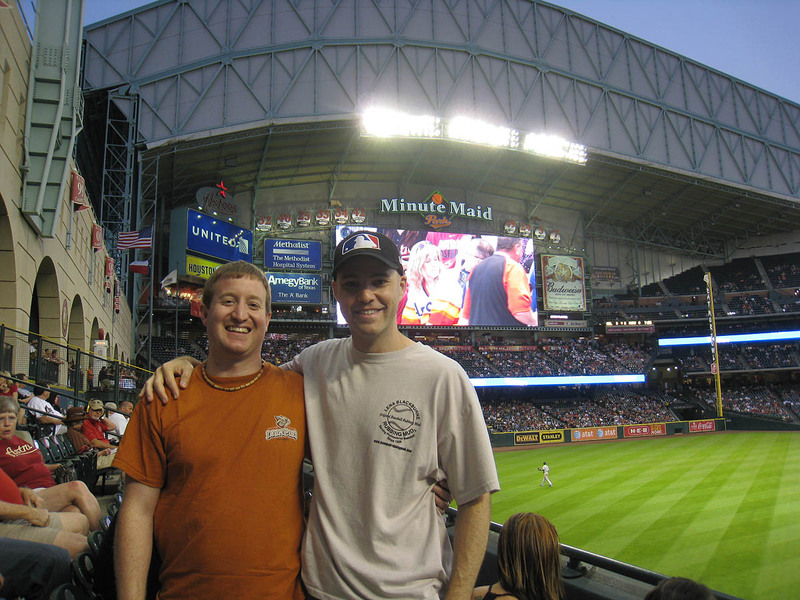 This was the third game I ever attended at Minute Maid Park and the first since August 18, 2005. From a ballhawking perspective, the worst thing about this stadium is that it opens just 90 minutes before game time. That’s the policy everyday except Saturday — the gates open two hours early then — but this was a Friday so I wasn’t going to have much time to work my magic. As you can see, there isn’t a railing in the front row — but the front row is always packed, so there’s never a chance to run there anyway. 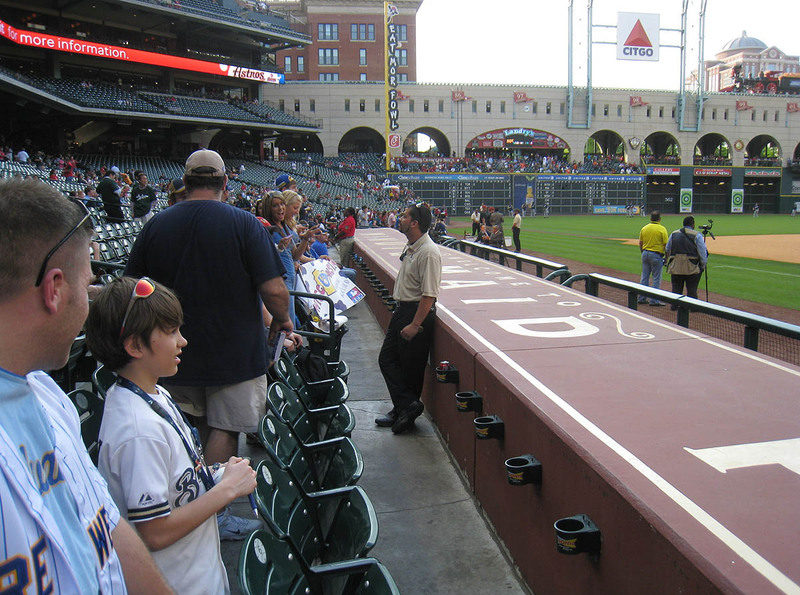 Since the railing blocks four of every five rows, that means there’s a space in the sixth and eleventh rows. But guess what? 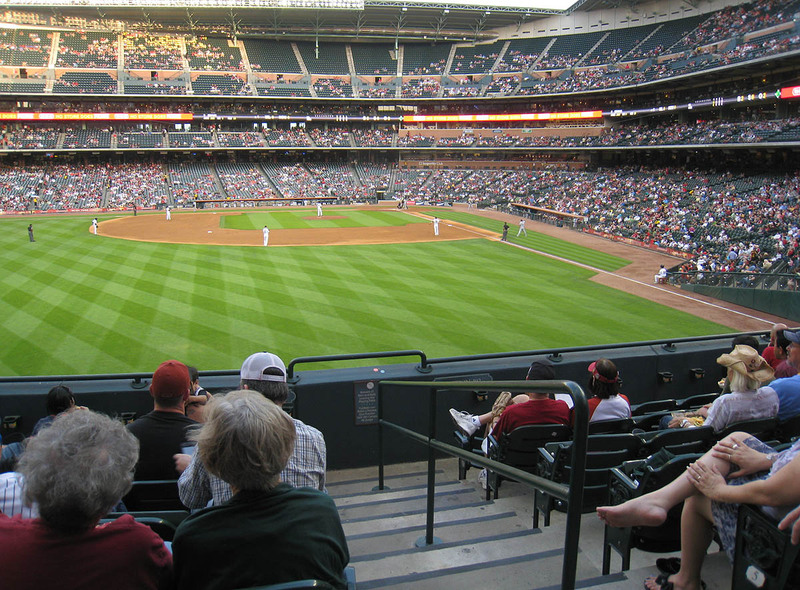 If you’re standing in the eleventh row, you’ll be tucked underneath the overhang of the second deck. In other words, if you’re hoping to run left or right for a home run ball, there’s only ONE good row in all of right field! 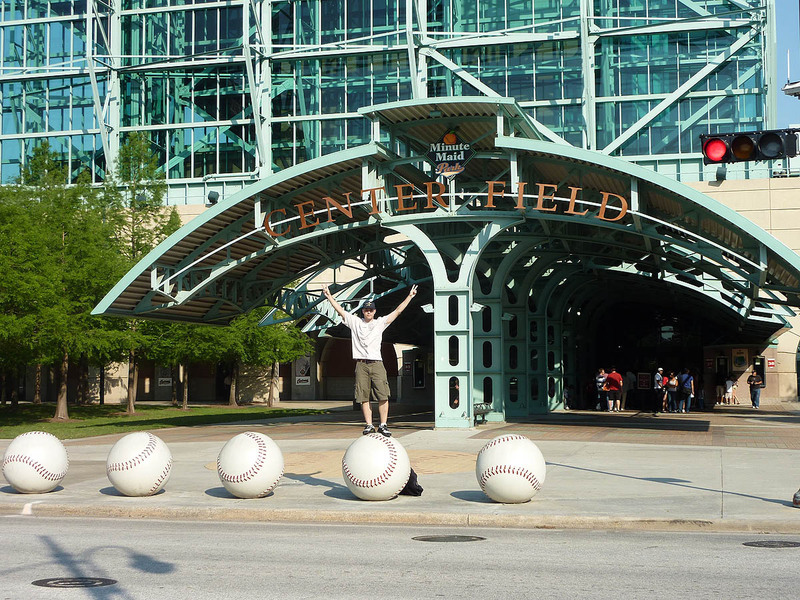 I truly couldn’t comprehend how I’d managed to snag 12 balls here on August 17, 2005. 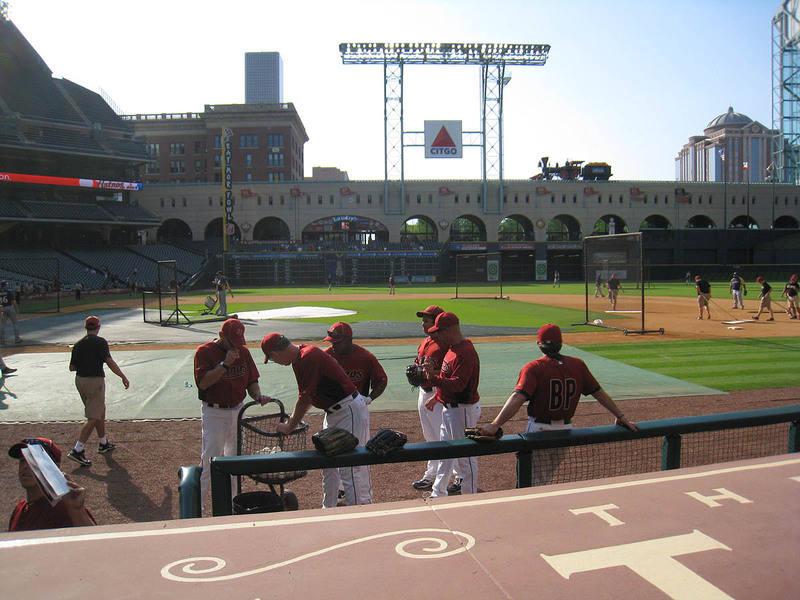 In the photo above, do you see the guy reaching up with his glove? 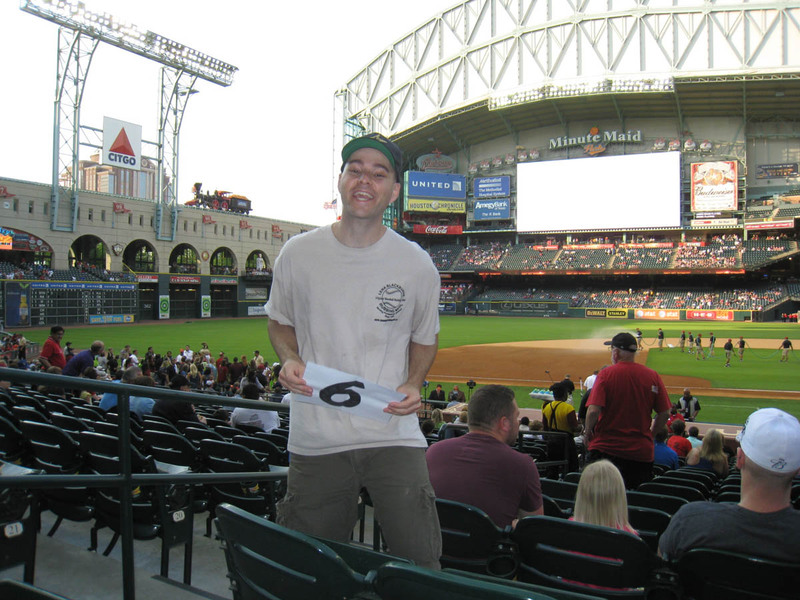 His name is Donny Haltom, he’s a semi-regular at Minute Maid Park, and he’s been reading this blog (and leaving comments as “txfilmmkr”) for years. This was the first time we’d ever met in person. See the kid standing a few feet in front of him? 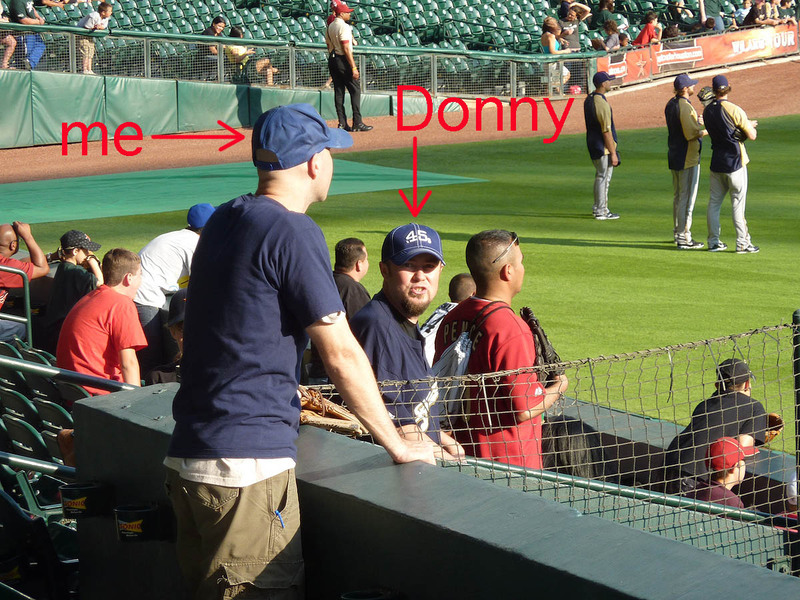 That’s Donny’s nine-year-old son, Lance, who was named after Lance Berkman. You’ll see a photo of them later on. …and I didn’t get anything. I never really expect to be given a baseball, but this was as close as it gets to a guarantee, so it was pretty disappointing. But maybe I should’ve known better. 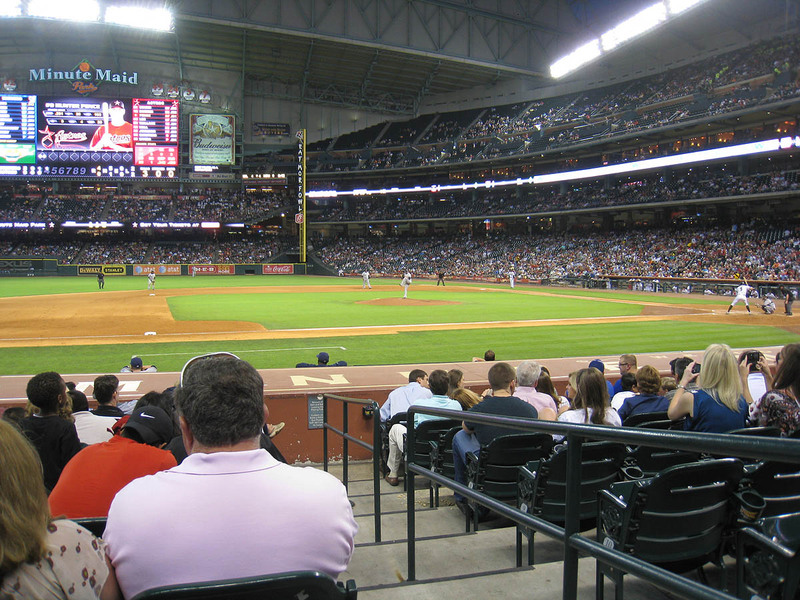 Since I first started attending games regularly in 1992, the Astros have been THE stingiest team in terns of tossing balls into the crowd. 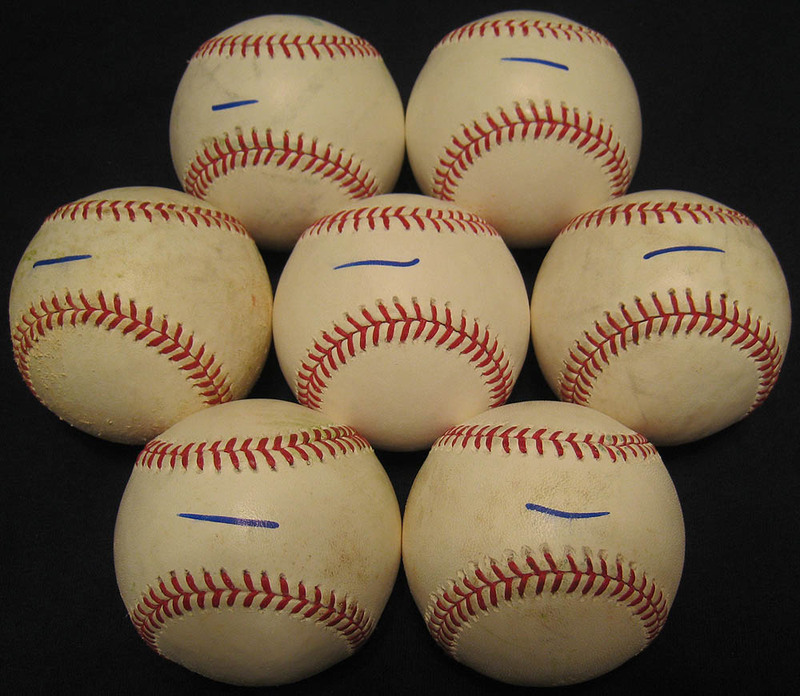 Why do you think they drew H’s on their baseballs for all those years? It’s because they were paranoid about their own players stealing them and getting them signed. BTW, all the photos of me were taken by my friend (and Houston resident) Mike Miles. You’ll see a photo of us in a bit. The rest of the stadium was empty, but that section was packed. No surprise there. 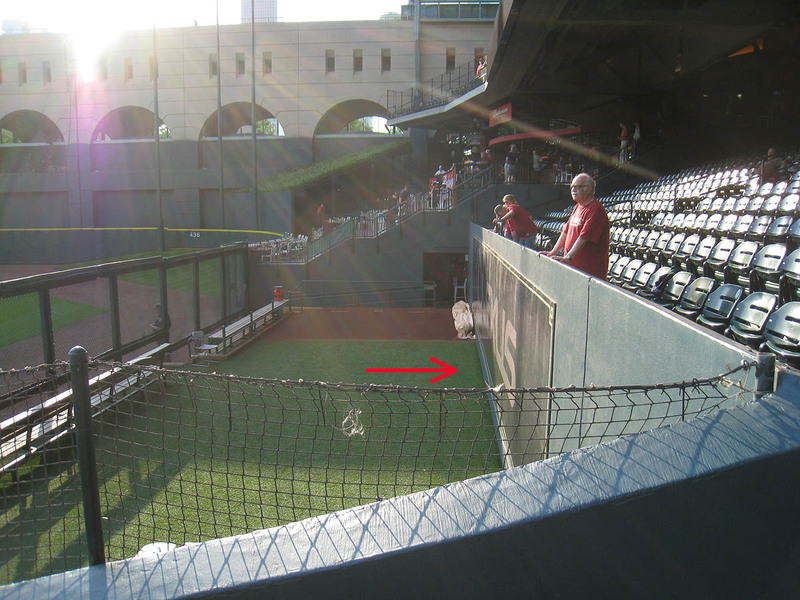 Someone had hit a home run that sailed through an arch, smacked the pavement in the concourse, and bounced up against the plexiglass windows at the back. I was able to run over and jump and catch the ball off the deflection. 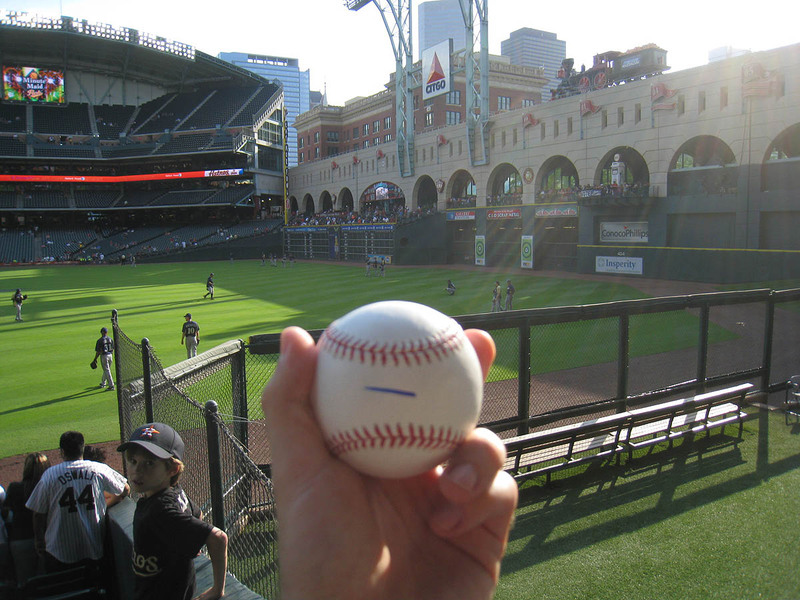 The Brewers, evidently as concerned as the Astros about theft, had marked the ball with a blue line on the sweet spot. 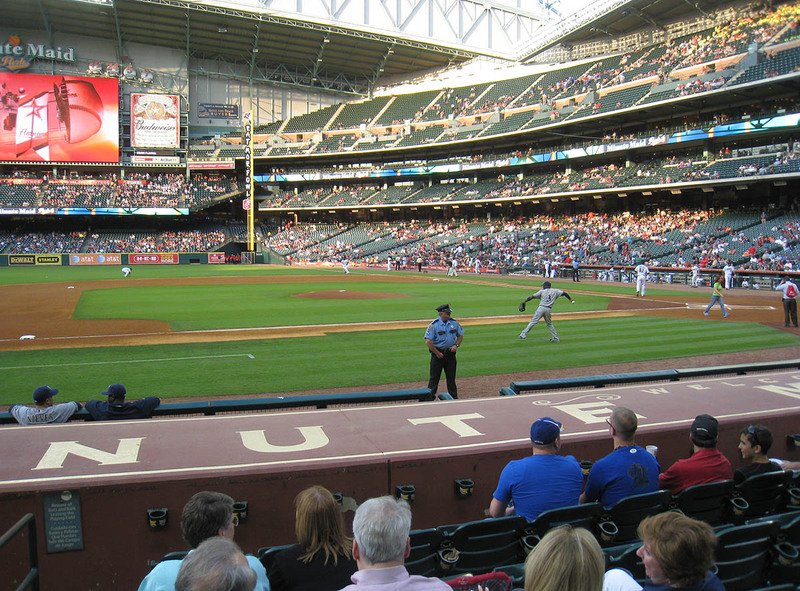 Fielder had hit a homer that cleared the bullpen and landed in the third row. Thankfully, the seats there weren’t crowded, so I was able to race over and grab it. I had to snag it quickly and carefully because there was a nearby security guard that Donny had warned me about. 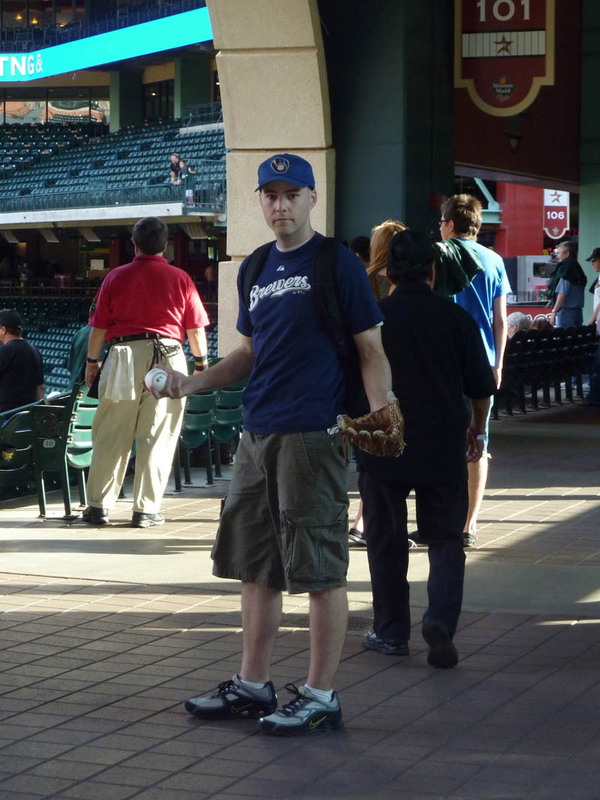 My 5th ball of the day was thrown by a Brewers pitcher that I couldn’t identify. It might’ve been Mitch Stetter, but I’ll never know. My 6th ball was thrown by Sergio Mitre, and it took him two attempts to get it to me. The first one fell short and landed in the bullpen. Most players, at that point, would’ve shrugged and walked away, but Mitre jogged over and unlatched the bullpen gate and retrieved the ball and flipped it back up to me. It was incredibly nice of him. 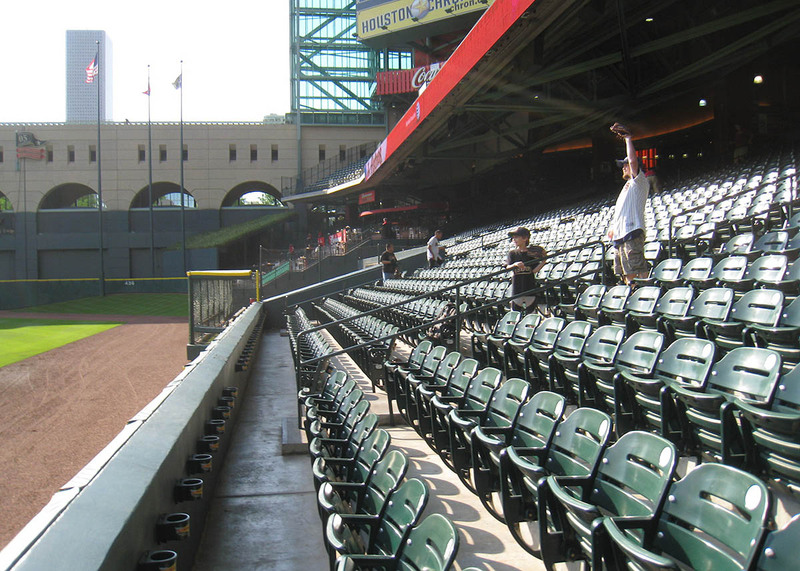 If the front row looks oddly empty in the photo above, that’s because the Astros don’t allow people to hang out there. Silly rule. 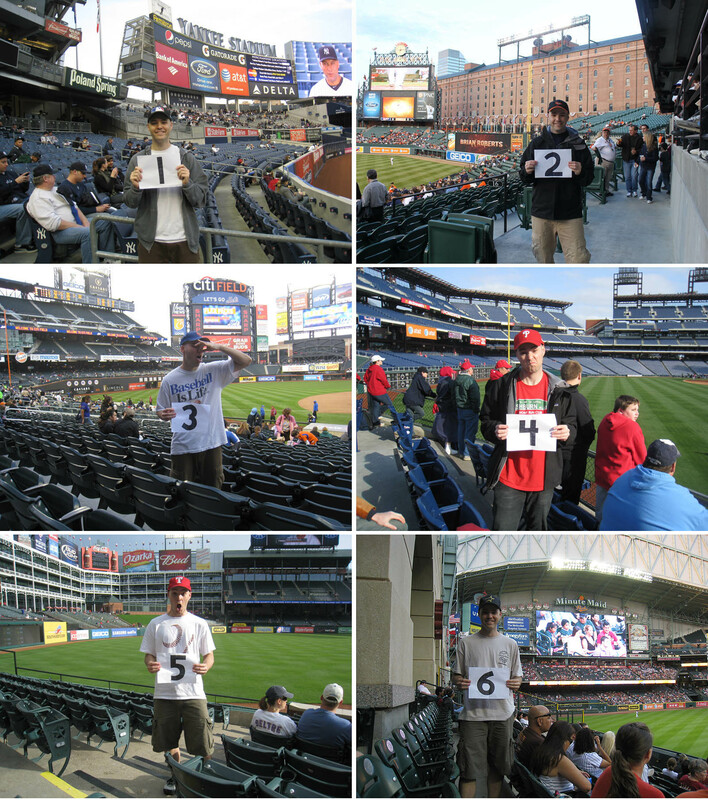 But it didn’t stop me from getting two baseballs. The first was tossed by hitting coach Dale Sveum. The second came from stud pitcher Yovani Gallardo. 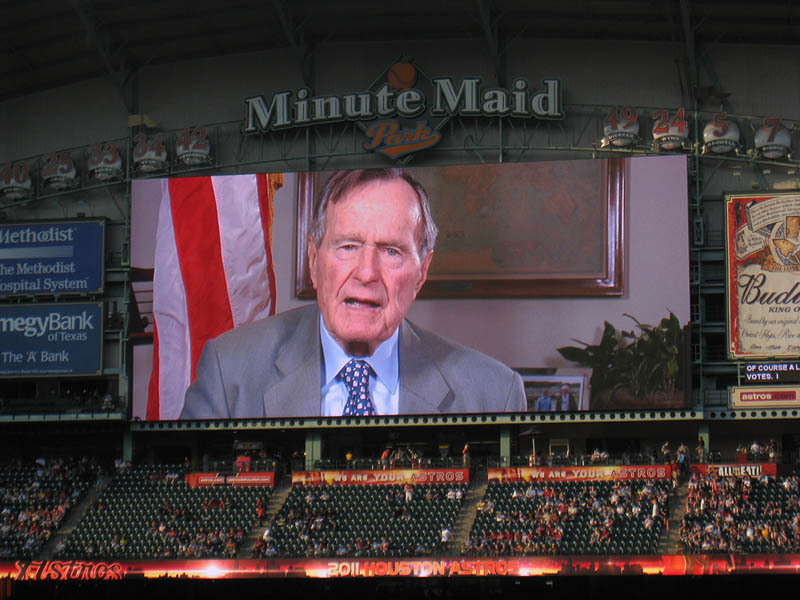 It had something to do with voting for Astros for the All-Star Game. …who tossed me the ball when they finished. He and I have known each other for about 13 years. We met because his high-school girlfriend was best friends with the girl I dated throughout college and, you know, everyone was friends with everyone at a certain point. Incidentally, his high-school girlfriend was with me when I caught Barry Bonds’ 724th career home run on 8/16/06 at PETCO Park. 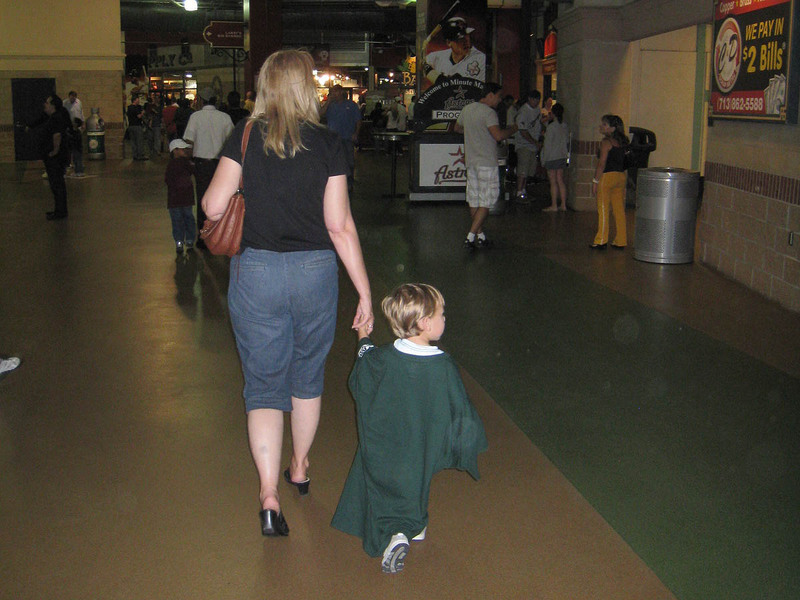 Mike might look familiar to longtime readers of this blog because he was with me on 9/26/05 and 9/20/06 at Citizens Bank Park. 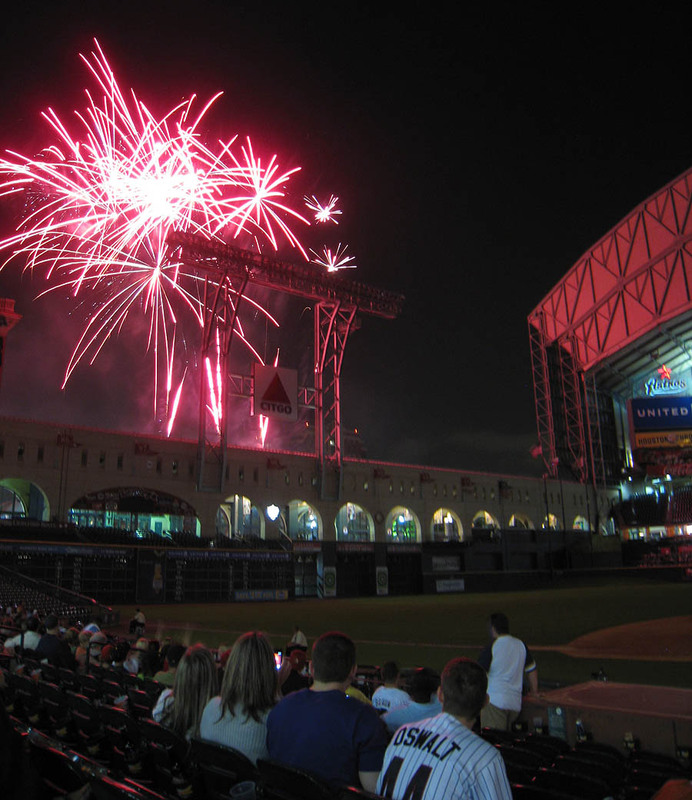 Actually, the game had ended by the time the fireworks went off. 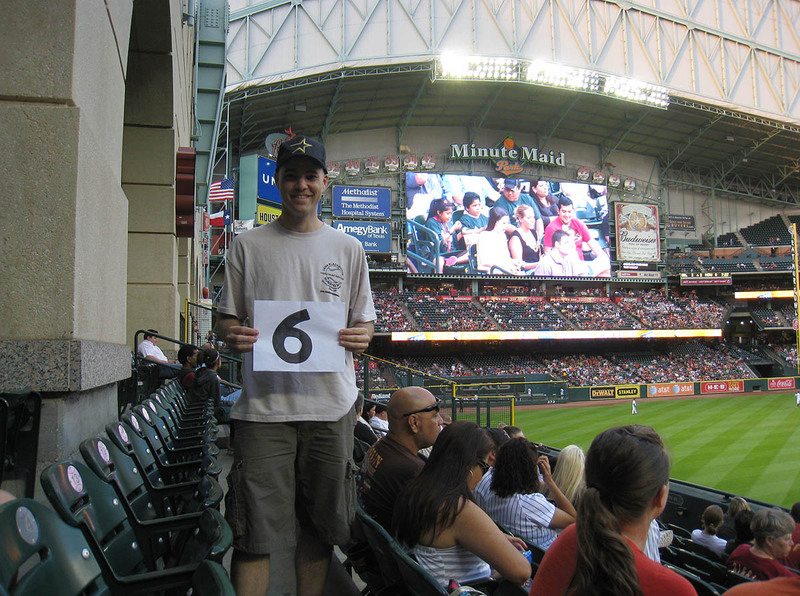 The Brewers won, 5-0, behind seven strong innings from Shaun Marcum. • 178 balls in 21 games this season = 8.48 balls per game. Just wanted to let you know that it is Shaun Marcum instead of Shawn that’s all, I presume your back in New York now? It was great to finally meet up with you on Friday. Hope Mike and I didn’t drive you completely insane. Thanks for letting me know. Silly me. I fixed it. It was great to meet you! You guys actually *kept* me sane, so I appreciate it. Haha, small world, isn’t it? 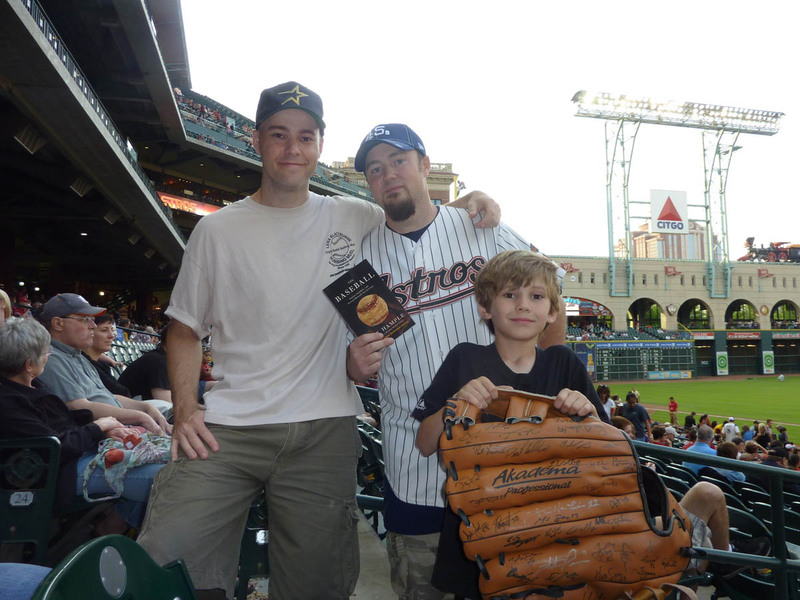 I wonder, how many ballparks besides Rogers Centre (and maybe Citizens Bank if they haven’t changed the rules) still allow the glove trick? It seems like less and less, if there were a few to begin with. You’re right. 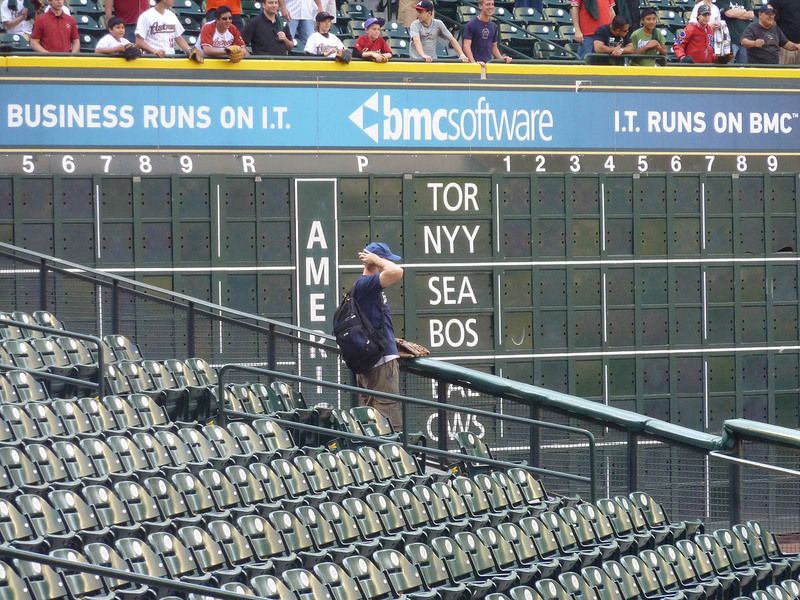 The numbers are dwindling, and in Philly, you can’t do it anymore in right field. There is (or at least recently WAS) a guard there who absolutely forbade it. It’s not hard to get where you want at this stadium. 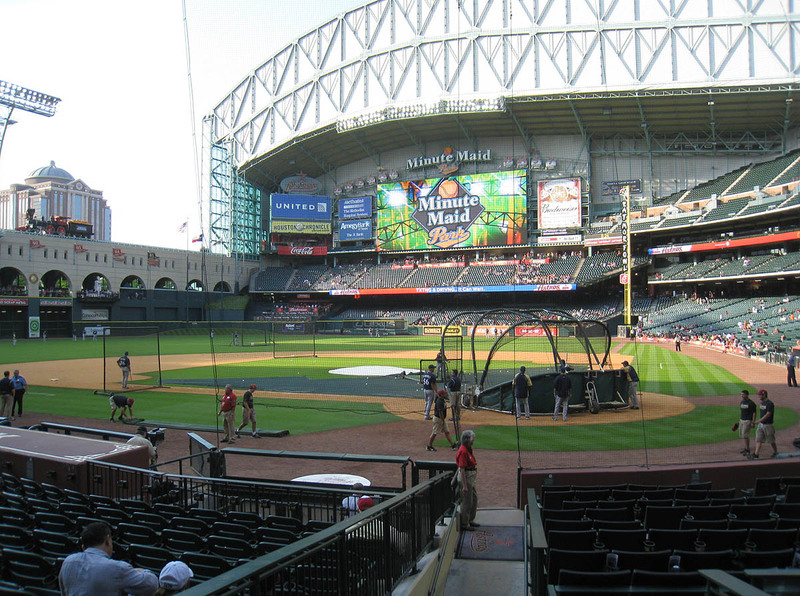 Just get down into the field-level seats before the end of BP, and then stay there. 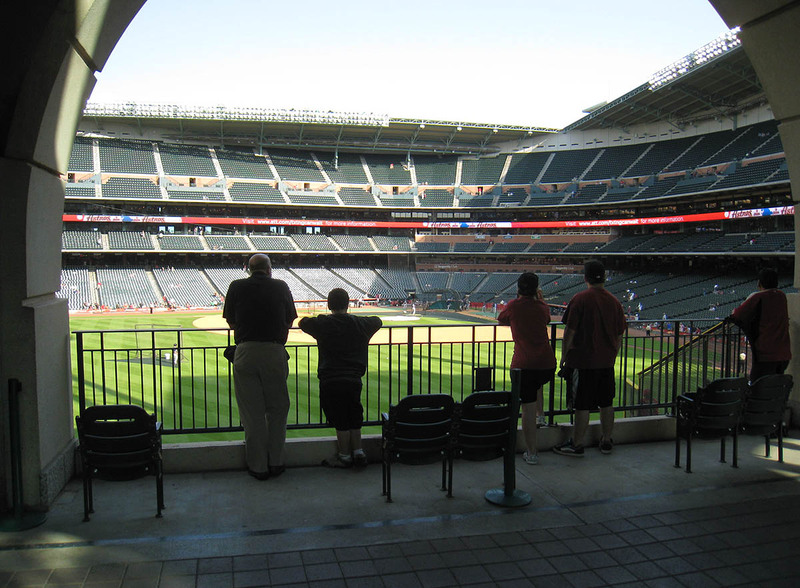 Which is the best entrance point at the stadium to get the crawford boxes or the rf area best? I think the Crawford Boxes are the best spot for the first minute or two, but then it gets packed. 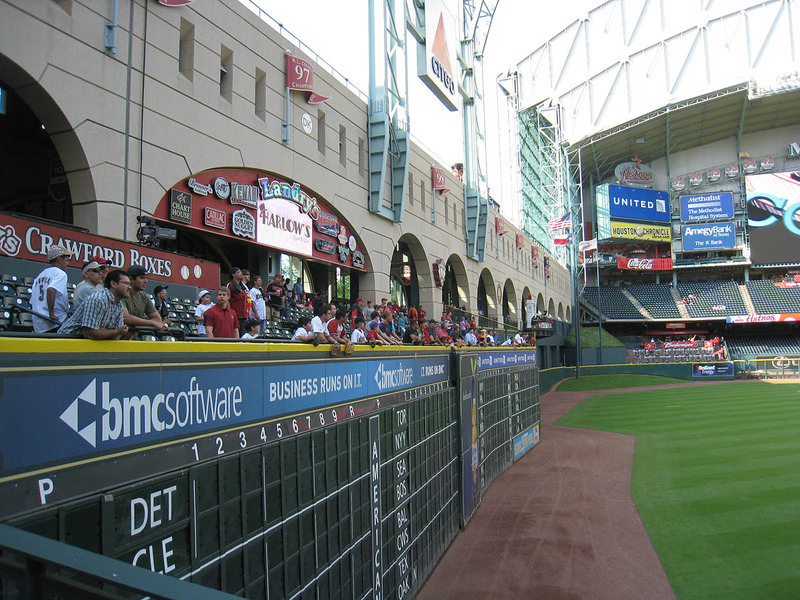 The hill in center field at Minute Maid Park pays tribute to left field at the old Crosley Field in Cincinnati. Babe Ruth once fell flat on his face chasing a fly ball up Crosley’s hill (so I hear) and absolutely hated playing there.